Check out our video on how to prune a neglected espalier apple tree. If you'd prefer for us to do the work, let us know! All trees will need pruning from time to time. The ideal time to prune most trees, evergreen and deciduous, is in the winter or early spring while they are still dormant. This allows you to clearly see the structure of the tree. Pruning while the tree is dormant also reduces the likelihood of pest and disease because they cannot function at this time of year. Young trees especially need annual care to create good structure that will ensure good form and health of the tree through its life. Large, mature trees may need a major limb removed, the crown thinned or overall height reduction for view preservation. Here are a few things to keep in mind when considering tree pruning. At planting, any damaged branches should be removed by providing a clean cut to eliminate the damaged area. It is essential that twine or any other constricting item such as label tags be cut to prevent the tree from girdling. If there are competing leaders, one should be selected and the others removed. Trees that have been planted for 3-5 years may show root or crown suckers; these need to be removed. Thinning of the crown is often needed to reduce competition for light and nutrients. A few of the lowest limbs should be removed. Crossing branches and narrow angled branches should also be removed. Trees are usually settled in their home and showing more vigorous growth at 5-7 years. Continue to limb up the lowest branches to a comfortable height for humans. Each year dead, damaged, or diseased branches should be removed. Cut back or remove branches that interrupt the overall form of the tree. As the tree matures it should be inspected while dormant for dead, damaged and diseased branches. If the work is above 12’ from the ground, a licensed arborist should be contracted. Remember that you never want to take more than 1/3 of the tree per year. All pruning stresses the tree and increases its susceptibility to pests and diseases. Be conservative. North of South Landscapes Inc is happy to help you with those young, impressionable trees. We also specialize in shrub pruning. Please schedule with us in the fall and early winter. It may seem a bit counter intuitive, but winter is a great time to begin the landscape design process. We will work with you and your home owners association (HOA) to develop a set of plans to meet your needs. We facilitate plan submittal to your HOA and assist in providing competitive estimates for the completion of your installation project. We work with your building designer/architect and general contractor to create a landscape that flows with the architectural style and character of home with emphasis on appropriate plant selections and efficient irrigation for our high desert climate. We can work together to accomplish your immediate and long term goals. If you need a landscape overhaul, we are happy to help with that too. We specialize in irrigation retrofits and low voltage lighting renovations. We will accentuate the existing successful components and compliment them with fitting additions. Each site has its own unique blend or attributes and constraints. North of South is adept in dealing with those constraints and emphasizing the opportunities of your property. As another Smart Irrigation Month comes to an end, it is a good time to reflect on irrigation projects and consider what is ideal versus what is reality. Smart Irrigation Month is an Irrigation Association (IA) initiative to promote the social, economic and environmental benefits of efficient irrigation technologies, products and services in landscape, turf and agricultural irrigation. As an active, certified professional with the IA, North of South Landscapes has been a supporter and promoter of Smart Irrigation Month for years. We work to educate our clients and inform them on how to improve their irrigation efficiency and how conserve water through their landscape while improving the health of their landscape. In the past year, we have seen and been involved in many successful irrigation improvement projects. We have also seen brand new installs that needed repairs, adjustments, or re-installation within the first weeks after construction. If you are considering a landscape/construction project, it would be in your best interest to consult with a landscape/irrigation professional to ensure your project will not create problems in your existing landscape or irrigation system. Below are some photos and descriptions of some not-so-smart irrigation issues that could have easily been avoided. This is a photo of a new asphalt parking area that paved over existing irrigation heads. The client was told the heads were capped off, however the sprinklers were just removed and did not have any type of cap or plug on the line. The new asphalt has been faded by the running water and had to be cut and opened up in order to make the repair. There was more than just one sprinkler head that was affected by the new asphalt paving. an irrigation consultation to locate sprinklers and advise on how to cap them would have been a fraction of the time and money it took to locate the paved-over sprinklers and to make the necessary repairs. it is unfortunate that whoever did this turf repair did not consider an alternative for the turf grass. This area is less than 2' wide and is impossible to irrigate overhead without wasting water. There are other landscape and irrigation options that would result in less water wasted and provide greater aesthetics as this turf will always struggle to look healthy as it is not in a desirable location and is difficult to irrigate and maintain. It is the landscape professional's job to inform the client as to what the best solution would be for their site and just because there was grass there to begin with doesn't mean that is what should be there now. this poor serviceberry has struggled since it was installed two seasons ago. it is planted on a slope and was irrigated with two drip lines that were incorrectly placed on the downhill side of the trunk as well as both lines were placed together instead of one on each side of the trunk. upon more investigation, it was discovered that the emitters irrigating the serviceberry were undersized as one was 1 gph and the other was 2gph, for a total of 3 gallons per hour when a serviceberry needs more than that to remain healthy. 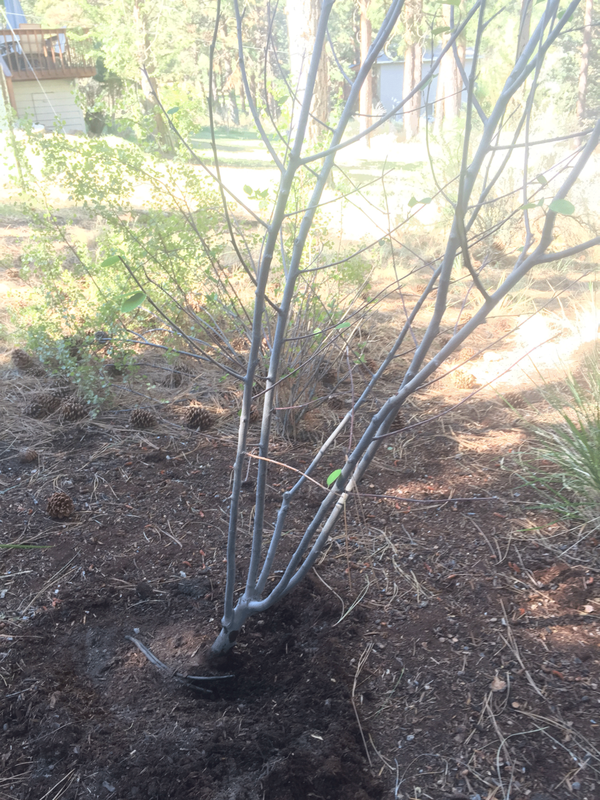 The remedy for the serviceberry was to install emitter line around the base to provide water on all sides of the trunk. Emitter line has emitters built in at every six inches to deliver water evenly around the tree. each emitter is 0.6 gph and now the serviceberry is getting 7.2 gph, more than twice what it had been receiving. this is a sprinkler head that had been covered with pavers. It was not known that there was a sprinkler under these paver stones as there were other leaks in the irrigation zone. Once those other leaks were repaired there was enough water available in the zone for this sprinkler to cause an issue. And once this sprinkler was capped 5 other leaks underground were found. even if you prefer to do your landscape projects on your own, it is valuable to consult with a landscape professional before any of the work to ensure your efforts can be successful and not create more problems for your landscape in the future. Let North of South Landscapes help you avoid any of these costly mistakes in your landscape projects. Give us a call today. With the existence of YouTube these days, it is possible to learn about and do almost anything yourself. However, it is unlikely that one video will be able to explain everything to consider or avoid in order to achieve success with a project. Landscaping is one subject that is difficult to replicate projects as no site is the same and each site has its own challenges, advantages, and objectives. Here’s a few pointers to help you get your landscape ready for winter in Central Oregon. Clean out pots and containers and store upside down for the winter. Ensure hoses are disconnected and stored. Close foundation vents. Prune for holiday greenery for wreaths and garlands. Select branches that are encroaching on your outdoor living spaces, walkway or impede visibility of vehicles. Plan ahead. Coordinate with a landscape designer or landscape architect for new construction or major renovations. Develop a plan for the vegetable garden, annual pots & borders; order seeds/starts. Water trees if Mother Nature hasn’t provided precipitation. If snow is present, shovel the snow towards trees. If there is a lot of snow on tree branches, knock the snow off to prevent breaking. Groom your tools. Clean, sharp tools work better. Prune deciduous trees. The trees are typically still dormant at this time. It is easier to see the branch structure. Remove dead, damaged, and diseased branches first. Then aesthetic choices can be made. Never remove more than 1/3 of a tree in one year. Now that it is officially Autumn, it is time to start thinking about winterizing your irrigation system. If you have not already signed up, please do so before September 29, 2017, and we'll make sure that your irrigation system gets blown out and turned off for winter. Lawns – fertilize; overseed bare or thin spots. This is also a good time to aerate the lawn. If you aerate, do this before overseeding. September is a good time for planting new plants or dividing large perennials. It is essential that these new plants have several weeks of water before turning off the irrigation system. After Labor Day, spread a black plastic mesh over your water feature to reduce the amount of leaves and needles that may fall into it. Rake up leaves and needles. Cut the lawn shorter; this help to prevent snow mold. You may need to accomplish this over a couple of weeks. You do not want to remove more than 1/3 of the height in a single mow. Mulch tender perennials with leaves or compost. Ensure irrigation system has been winterized. A licensed landscape contractor is required in Oregon. Remove fuel from small engines or replace the carburetor in the spring. When purchasing the bulbs there are few things to look for. The bulbs should be firm. Soft spots, bruises and mold are indicators of inferior products. Bigger bulbs generally produce more blossoms that smaller bulbs of the same variety. Right plant in the right place. Even the highest quality bulbs will fail if they are planted in the wrong location. Most bulbs prefer at least 6 hours of sun per day. Select bulbs that are well suited to the location you want to place them. Read the package or product description carefully to determine their cultural needs. The planting depth of each type can vary significantly. A rule of thumb is to plant the bulb 2-3 times deeper than the bulb is tall. A 1” tall bulb should be planted 2”-3” deep. The required planting depth will also be indicated on the package. The pointed end should be up. Look closely at the bulbs and you’ll notice that the roots come out of the wide end. Bulbs prefer good soil. The silty and sandy soils in Central Oregon should be amended with compost to provide nutrients for the bulbs. Adding a bit of bone meal to the bottom of the hole helps to stimulate root growth. Stop weeds! Not only are they unsightly, they steal nutrients from your desired plants. Adding 2”-3” of mulch is effective in weed prevention and holding moisture. Water in the bulbs after planting. This settles the soil and encourages root growth. If the bulbs dry out, their performance will be stunted. Consider the critters in your area. Deer are notorious for eating Tulips. Plant tulips in locations that will be uncomfortable or awkward for the deer. Or consider a different bulb that is less appealing to the deer like Daffodil. If there are squirrels around, they may try to steal your freshly planted bulbs. Chicken wire installed over the top of bulbs and then covered with the appropriate amount of soil and mulch can detour the squirrels. Mass plantings have a big impact. Large quantities planted in concentrated areas will impress you and passer-bys. Consider the bloom time. For example, daffodils are labeled as early, mid or late spring bloomers. By mixing varieties from each of these bloom times you can extend the blossoms over several weeks. In order for your smart technology to truly save you water and money, your irrigation system needs to be worthy of such advanced controls. If you have a broken nozzle or a misaligned sprinkler head, you will still be wasting water and have dry spots in your lawn no matter how fancy your irrigation controller is. Plant summer/fall blooming bulbs. This includes any that you may have lifted for cold protection last fall like dahlia or gladiolas. Continue to remove weeds. Bark mulch 2”-3” thick can help prevent weeds and maximize water consumption. Continue to remove spent flowers (deadhead), especially from annuals and perennials. Monitor irrigation and make necessary adjustments. Consider raising the height of your lawn to 3”. Keeping the lawn a bit longer in this hot month helps to shade the soil and retain moisture. 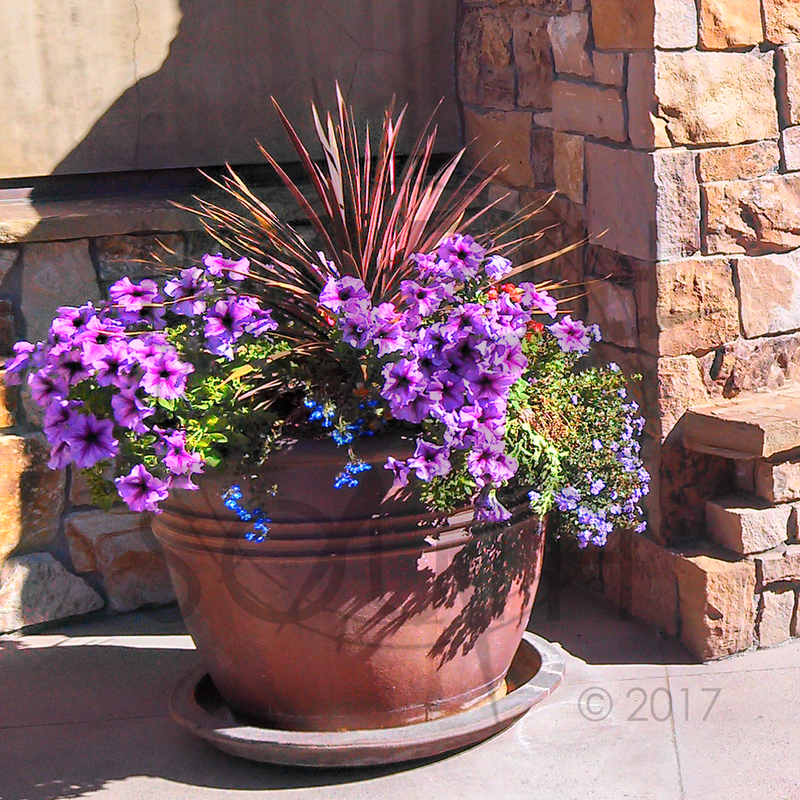 Bright pops of color and dramatic flower pots at building entries are a sure sign that our growing season has arrived. Old folk lore for Central Oregon is that you should wait until the snow has melted off of Black Butte. We often use Memorial Day for scheduling “color spots”. Terra Cotta is the classic material that lends itself nicely to most gardens. Poured concrete and stone are other classic materials that age gracefully. Glazed terra cotta pots are a great way to emphasize a color scheme. These are materials result in heavy containers and they are prone to cracking from freeze thaw cycles. A best practice is to store them out of the elements for the winter. Depending on weight, this can be a significant challenge. In today’s market there is a wide variety of plastic composite and fiberglass plant containers that come in many shapes and colors to look like concrete, terra cotta or ceramic. These new materials offer desirable styles at a fraction of the cost and weight. The porosity of the materials will also affect water usage. And ALL containers need drainage. This may seem glaringly obvious as some locations are typical: flanking the front door, corner of the deck/patio, hanging basket along the porch. Perhaps one of the most crucial things to consider in location of flower pots is its proximity to water. In the high desert, irrigation is essential. An automated drip zone tied into your existing irrigation system is ideal. This allows you to get away for long weekends full of fun and adventure and return home to pretty flowers. A chosen and planted container can also serve as a focal point in a visual corridor or feature in a planting bed. The scale of the container is determining factor for this situation; bigger is better. A soil mix formulated specifically for flower pots is best. If you want the best, get one with mycorrhizae to help stimulate root growth. If you have a couple of containers that getting drip irrigation to is next to impossible, we suggest mixing in water absorbent polymers. These act like tiny sponges and will extend the duration between watering. Thriller, Filler and Spiller is the most common recipe. A tall item in the center creates drama i.e. thriller. Mounding forms of color generates the filler. Trailing vegetation over the edges of the container provides the spiller. Fragrance is worth considering as you are making your plant selections. Certain plants can detour undesirable bugs and critters. Mint, thyme, and marigold are a few examples. Have fun at the nursery or garden center and play with different colors and leaf textures. Group the plants together to create mock ups of the finished planting. To keep annual plants looking their best, we recommend alternating between deadheading (removing spent flowers) and feeding with a general flower food every week. These are good habits that provide the opportunity to keep any eye on which plants are flourishing and which may need some adjustments to their care. We are wishing you a season of abundant flowers! A common source of confusion for many is gardeners are when to prune flowering shrubs. Here are some general rules to keep in mind. Most shrubs benefit from an annual pruning. The primary goal of pruning is to first remove any dead, damaged or diseased branches. If your shrubs are healthy and you prefer the shrubs to have softer, loose form you can even skip pruning a couple of years. Early spring flowering shrubs are best pruned immediately after they are done flowering. Rhododendrons, Forsythia, Lilac are a few common shrubs that set their buds the prior season. Pruning after flowering is completed ensures the most buds for the following year. Many summer flowering shrubs prefer to pruned while dormant. Spirea, Caryopteris and Potentilla are prevalent in Central Oregon. Sometimes you just have to prune. If the shrub is blocking the front walkway, go ahead and open up the access route. It won’t kill the plant to remove a couple of branches. We are looking forward to this upcoming presentation in collaboration with the local chapter of the Community Associations Institute, the City of Bend, Storm Water Services and our own Angie Snell of North of South Landscapes. Thursday, April 27th 11:30am-1:00 pm at the Oxford Hotel in downtown Bend. Water is a precious resource. Landscape irrigation is one of the biggest users. Watch this short, informative video from the City of Bend with cameo appearances by Angie and Molly of North of South Landscapes Inc.
Avoid walking through infested areas. Pets especially can spread the noxious weed seeds. Keep your property free of noxious weeds. Do NOT put weeds in yard debris or compost bins. Contribute to you weed removal in your community by participating in events such as “Let’s Pull Together”. Noxious weeds in Deschutes County are rated as A, B, or C. The A list weeds are the highest priority with ecological and/or economic importance. B list weeds are abundant locally and in neighboring regions. C list weeds have the potential to harm agricultural production and transportation systems. Certain noxious weeds in Central Oregon have become so widespread and thoroughly established that they have been declared to be a menace to public welfare. Steps leading to eradication where possible and intensive control are necessary. 1. Trees create shade. Deciduous trees (trees that lose their leaves) provide shade in the summer, reducing air-conditioning needs which reduces energy demands, and can reduce the urban heat island effect. A shade tree on a sunny day provides welcomed reprieve as well as the most coveted spot in the parking lot. 2. Trees provide privacy. Trees can create screening barriers for unpleasant views, walls, or neighbors as well as frame pleasing views. A strategically placed tree can mean the difference between being comfy and relaxed versus having to order new window coverings. Trees can also dampen street sounds, provide wind breaks and capture dust. 3. Trees prevent erosion. Trees reduce stormwater runoff by intercepting and slowing rainfall allowing it to be absorbed by the soil and roots. This keeps soil in place on steep slopes, hillsides and waterway slopes which reduces water pollution as well. 4. Trees sequester carbon. During the process of photosynthesis, trees remove carbon dioxide from the air, store the carbon and release the oxygen back into the air. This helps combat climate change and provides oxygen. 5. Trees provide habitat. Many trees including oaks, maples, and ash provide excellent homes for birds and squirrels as well as food and pollen for many more critters. Even dead and dying trees also create habitat opportunities for many birds and insects. Trees also provide habitat for people with wood for home construction and wood to burn for warmth. 6. Trees increase property values. Well-planted and maintained trees can increase the value of a property, surrounding street, and neighborhood from 10 – 15%. Trees can also generate a theme and provide unity throughout a neighborhood and can also serve as a landmark. 7. Trees provide seasonal interest. Deciduous trees provide seasonal interest with colorful flowers in the spring, lush foliage for shade during the summer, beautiful colors of autumn from the fallen leaves, and stimulating branching patterns look even more inspiring with a coat of fresh snow and ice. 8. Trees provide food. Trees not only provide food for animals and insects, but trees also provide food for people. Fruits, nuts, chewing gum, maple syrup, and chocolate all come from trees as well as other household products such as sponges, corks, and dyes. 9. Trees reduce stress. Trees and landscapes have been known to reduce stress by lowering blood pressure, this improves moods and reduces anxiety. Exposure to trees and nature has shown to reduce fatigue, increasing mental stimulation as well as reducing patient recovery times. 10. Trees create special places. Trees are often the ceiling to our outdoor rooms but many times they can be the whole room themselves. Building a tree house, installing a tire swing or zip line, or climbing as high as you can provides an unique experience that only a tree can provide.